Tonight, I got my Windows 8 RTM installed on a VHD. I have to admit that I was skeptical of seeing the Metro interface that looks a lot like Windows Phone on a desktop. I didn’t think I’d like the user experience, especially being on a laptop with a touchpad and no touchscreen. The only thing I’m grumbly about so far is that it told me to install the Zune software to sync my Windows Phone with my PC. Yeah, I don’t feel like ruining my fresh install (and my happiness) with that awfulness, so my phone will have to deal without a relationship to my laptop for now. While looking around the Windows 8 Store, I found some apps that I just had to have. These are some of my must-haves and why. Xbox SmartGlass– This app encourages my laziness with the XBOX. It’s bad enough that my 4 month old son hears me commanding the XBOX with voice commands thanks to my Kinect. But now, while I’m tending to my little guy’s needs, I can also control my XBOX from my laptop with this Xbox companion app. I no longer will startle my son with Kinect voice commands while he’s eating as I have this to control the XBOX. Did I mention this encourages my laziness? 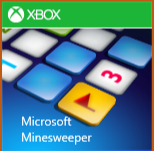 Microsoft Minesweeper – Oh dear… did I just recommend Minesweeper? Yes, yes I did. This is a game of the past that continues to get more awesome – complete with themes, achievements, daily challenges (coming soon), and yes, even an adventure mode (coming soon). It’s nice to see how this game has grown over time to look better than the battleship grey sad thing it used to be. TEDw – If you aren’t familiar with TED talks, you can find out more about these motivational talks on TED.com. This app puts recent TED talks right at your fingertips. For example, when I look at the app now, I can easily access talks such as Rob Legato’s “The art of creating awe” and Timothy Prestero’s “Design for people, not awards”. These are truly ideas worth spreading, and the TEDw app is great at spreading those ideas! Microsoft OneNote MX – As I am writing this post, I have OneNote MX docked to the right with the list of apps that I’m recommending. I’m a OneNote junkie – love using it to organize ideas and take notes! So for me, I love keeping it docked while working on things to jot down that one idea that happens to come at the wrong time. How Stuff Works – I love the site, and my father-in-law and husband are both huge fans of the How Stuff Works books. Some random articles from the app include 5 Things You Can Do to Make Your Car Safer for Driving in Foul Weather, Does the Higgs boson exist?, How Hackers Work, and 10 Remarkable Exoplanets. If you ever wanted to know how random things work, this app could probably quench your thirst for figuring out how things work. These are some of my must-have recommendations for Windows 8 apps as of this point. As time goes on and I stumble across more fun apps, look forward to future recommendations. Meanwhile… do you have any Windows 8 apps that you recommend? Either blog about it and leave me a link to your post or leave me a comment with what you recommend! I look forward to hearing what others are recommending!